Dr. Herzberg was born in Hamburg Germany on December 25th, 1904. Herzberg studied engineering, received his degree in 1927 and obtained his doctorate in 1928 from the Darmstadt Institute of Technology in Germany. Herzberg and his wife, Luise, an astrophysicist in her own right, left Germany in 1935, after it became illegal for Herzberg to teach in German universities since his wife was Jewish. The Herzbergs learned about Saskatoon after Dr. John W. T. Spinks, a visiting scientist from the University of Saskatchewan, traveled to Germany in 1934. Dr. Spinks worked at Dr. Herzberg’s laboratory in Darmstadt, Germany. Due to the severity of the Depression, there was a lack of funding at many Canadian universities, despite this issue, the President of the University of Saskatchewan at the time, Dr. Walter C. Murray, wrote to the National Research Council of Canada and the University of Toronto to look for positions for Dr. Herzberg. Dr. Murray was able to secure funding from the Carnegie Foundation and Dr. Herzberg became a guest professor at the University of Saskatchewan in 1935. Dr. Herzberg became a research professor in the Department of Physics and lived with his family in Saskatoon for ten years. Commemorative plaque at University of Saskatchewan | © Goethe-Institut Montreal Dr. Herzberg then left Canada in 1945 to become a professor of spectroscopy and further pursue his interest in astronomy at the Yerkes Observatory of the University of Chicago, but in 1948 he returned to Canada and would eventually become the Director of Physics at the National Research Council. Dr. Herzberg’s laboratory in Ottawa was a site for innovation and training new generations of young scientists. Herzberg went on to give a number of lectures in the U.S. and Europe and was awarded many medals and awards, such as the Honour of Canada, while also receiving honorary degrees from a number of Canadian and international universities. Herzberg was the first Canadian to win a Nobel Prize in either of the increasing related fields of chemistry and physics. 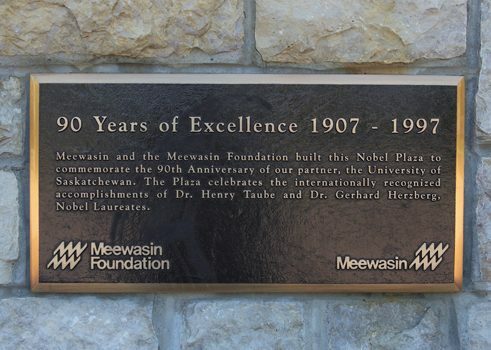 Both the Herzberg plaque and Nobel Plaza at the University of Saskatchewan commemorate and celebrate the achievements of the scientist. In the Physics building on campus there is a permanent collection documenting Dr. Herzberg’s time in the department. While the city of Saskatoon also paid tribute to the scientist with the naming of Dr. Gerhard Herzberg Park. Both the city and the University commemorate this Nobel Prize winning German-Canadian scientist who lived in Saskatoon with his family for over ten years and contributed immensely to its scientific community.